“I am compelled to speak now. You know the necessity of it here. Things evaporate and die if they don’t find someone to remember them.” Take these lines, simple as they may seem, as a definition of the novel. They appear, a characteristically fleeting paragraph, early in Ghassan Zaqtan’s 1995 novella Describing the Past, the first prose work to appear in English by the great Palestinian poet, titled with this delicate, deliberate flatness. What novel, after all, could not be well named Describing the Past? (“If the true subject of the novel is time,” I remember a teacher once saying off-handedly; I don’t recall what clause followed, or have yet to decide what clause should.) 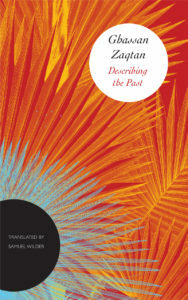 Zaqtan’s narrative enacts the fluidity and intimacy of dream, yet bears the full weight of memory. The setting is the Karameh refugee camp in Jordan, where Zaqtan lived as a child — his family’s second displacement and relocation, as Fady Joudah’s foreword informs us — and later site of the 1968 Battle of Karameh, in which Israeli forces destroyed the camp. Three narrators — “I,” “he,” and “she,” two young men and a young woman in Karameh — divide the novella, their short sections moving through time and across subjectivities not freely but with the transformative force of loss. To call the novella haunting would be insufficient. The prose has a rare, fugitive quality: a narration that seems to envy the air, envy the breath of the other, and which knows in contrast its own confinement. “I am compelled to speak now”: it is this “now” that slips away from the reader, draws us into pursuit. When is the “now” of this or any novel, when could “now” be said to occur? A novel is a bridge to the past — a process of recollection; a present (that has passed) from which a voice may speak of what is past — but here the far banks of the river are mist, groundless: the bridge can’t end. “Now” is the already vanishing time of the story’s telling, description an artifact of the past’s violation of the present, or vice versa. The novella’s “I” (sometimes, “the Christian”) and “he” (sometimes, “the Iraqi’s son”) desire the same woman (“she”), who is married to an older man, the Hadj, her mother living with them in the Hadj’s home. In time, her mother dies; the Hadj dies; later, “he” drowns, after he and she have married and had a child. And this novella, in turn “stays there” — stays here? — with the reader. That we cannot secure ourselves within the novella’s webs of chronology and identity only increases the mesmerizing power of the prose, how potently “the tone describes and grants and draws.” “Things evaporate and die if they don’t find someone to remember them”: this was the third of the sentences I emphasized above, and serves to describe the workings of the novella from within and from without, as the reader becomes the one who is asked to bear witness, to remember these stories and the story of their telling. And I do not mean to elide that these stories are Palestinian, as is the loss they both recall and presage. This novella won’t cease testing the dream that is memory, the hope that memory may yet salvage the past. The image of the woman endures, but endures only “suspended in the air,” as if on the verge of evaporating; and the one to whom this image had come to belong is already gone, drowned in this very river. Hilary Plum is the author of the novel They Dragged Them Through the Streets (FC2, 2013) and the work of nonfiction Watchfires (Rescue Press, Fall 2016). She lives in Philadelphia.